Here are some photos of some rosacea flare ups from the year 2000. At that stage I was trying to work out whether they were caused by being too experimental with new treatments or trying to cut out the antibiotics too quickly. Being mostly fair skinned, a rosacea red nose stands out a mile away. Many people mistake this redness as sunburn, acne, or may even call it acne rosacea, but in reality, you need to understand rosacea as separate disorder in order to treat it. Until I was formally diagnosed with rosacea, I could never answer the question – Just why is my nose red? and Why do I get acne on my nose at my age? Perhaps you, too, would like to answer these questions. Almost everyone who gets diagnosed with rosacea is shocked that what looks like a teenage skin problem comes to visit them middle aged or even as a senior. As you can see, my rosacea symptoms include acne, papules, pustules, red nose, mild swelling and flushing. These kind of symptoms would last for several days, and even more papules and pustules would take over as current ones healed. I convinced myself that new acne bumps and lumps would grow overnight ; each morning more would be there. I would say that I had these rosacea symptoms for about 15 years or so. It was very frustrating for sure. This is some of the worst rosacea pictures of me that I have photographs of. Like most rosacea sufferers, I didn’t like my photo being taken, so I don’t have records of any more `impressive’ symptoms than these. See also my successful rosacea treatments for more information about how I’ve become symptom free. Update: I recently wrote an article titled How to cure a red swollen nose. I hope that this also helps you battle your red nose ! Hi Cindy ,,,Brenda is the cheaper form of Diane…..a contrceptive pill used to treat acne.It worked with minimizing facial hair for me as well. Had rosacea now for 10 years. My mum suffered with a red for years. It used to be a nightmare for me going in any room that had central heating. I would feel the heat rising. I never got the spots but just my face would be red nearly all the time. The pain of the burning face too was awful. Then I saw a poster from the red cross in a chemist advertising camouflage make up by Dermacolor. This was available on prescription. I wore it for years. It did the job of covering my face but it was very heavy and mask like and in summer it wasn’t very comfortable. The last few months I’ve discovered putting mineral make up on instead. Much lighter and doesn’t feel so heavy. I also started taking a zinc tablet each day and putting zinc and castor oil cream on my face morning and night. I am pleased to say that my face looks ‘normal’ now. Haven’t had a hot flush since I started using the zinc. Its such a relief to be able to go to work and not have to worry about the heat etc. Its also nice to not have to wear make up all the time, I used to look like a beetroot! I’m new and a little confused about how to navigate the site. I’d like to post in the forum section but can’t seem to find an option that lets me. Alternatively I could simply ask my question here. 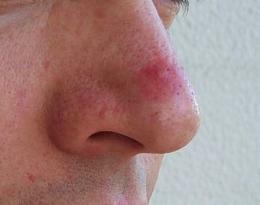 I have rosacea, only on my nose, and very noticeable. I have excellent skin but my nose is pink to blue deep purple depending on the situation. I don’t flush, blush, have pimples or papules. I simply have an ever swollen, oily, nose that is riddled with enlarged pores, black heads and a maze of broken veins. The veins at the sides of my nose being large and noticeable. I am not affected by heat but cold is a major trigger. My nose itself is always constantly cold to the touch. I do not have cold hands or feet. This problem is persistent and I often find myself in a warm room with a cold nose. I’m literally at my wits end. Red cheeks I could cope with but a purple nose? It’s ruining my life. I’ve had antibiotics which I can’t take more of as I suspect they had a hand in triggering the auto immune disorder I was recently diagnose with. I had two IPL’s which initially improved things but it came back worse. I also had veinwave which was a dead loss. The same veins that I’ve had for years reappear so eventually. it’s not a case of new ones appearing. I’ve become severely reclusive and wont have my photo taken, have put on a huge amount of weight, have lost all my confidence and am literally in despair. I fear it’s actually low level rhinophyma and as I couldn’t risk acutane with my Graves disease I’m not sure what to do. 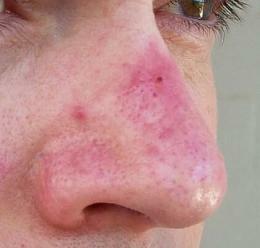 The nose is oily, swollen and the slightest thing that touched it causes the redness to worse. At normal colour ion waking it’s pink to rosy. At worst purple. Please help. lack or circulation there because it is cold. Mine swells in heat and loves the cold. do you mean oily- sometimes it is just shiney from inflammation and looks oily. name who precribed it for me. an old rhinoplasy job I had years ago and the swelling is causing rosacea. It is wierd. I am looking into too much iron in my system which can cause swelling. So far I have eliminated dairy completely as well as cereals and processed carbs. I do know niacin in these make it worse as well. I have suffered with rosacea since my teenage years and my mother has as well. My rose has always has a deep reddish color (almost purple) to it, and I’d get these little acne-like bumps on my cheeks near my nose and on my chin. My skin is oily, which seems to make the problem even worse. I’ve been to the dermatologist who recommended EVERYTHING for me with no luck and then he told me to try OPC-3 Beauty blend (don’t ask me what the OPC stands for) but it is an anti-inflammatory and has helped with the swelling. My spider veins on the sides of my nose also seem to be lighter. Has anyone else tried this before? I buy it online at http://www.shop.com/cutting and it’s abut $70 I think. Seems to be worth the investment though and mine’s lasted over a month now. The thing I’ve found is that I have to take three doses a day instead of the one dose it recommends, but my doctor said that was fine because of the natural ingredients in it. Anyway, seems to work for me, and it may for you too. I have had acne/rosacea since I was a teenager. I am now 40 and still suffering from the affliction. My rosacea got that bad a year ago that I had a constant red burning itchy face 24/7. Heat, cold, light any thing I ate made it worse. Even the light emitted from a standard light globe aggravated my condition. I barely went out for 6 months. One of dermatologists I saw said he had never seen a rapid onset rosacea like this before. And he has been practising for over 20 years. The cherry Red nose was the worst symptom. Any thing I ate my nose would go from light red to cherry red. It was an amazing thing to witness. I had to have creams and or moisturisers on my face 24/7. I had no choice, I had to put something on it. It was a nightmare. One dermatologist got me on to bactrim, one of the few medications I had not tried. Combined with major lifestyle and dietry changes things have settled down a bit. I could write a book on how rosacea has changed my life. All you can do is educate yourself about the condition. Experiment with the available therapies and hopefully you may alleviate some of your symptoms. I am just glad I have not had any children. At least none of this crap is going to be passed on from me. Cheers. David, I have pustular which leaves wounds all over my face, specially under my eyes, the skin dries and comes off, I look like Freddie Kruger when it flares – after years and years of spending silly money on treatments and taking all sorts of pills (you name a cream or medicine, I took it) and my last flair before this last was seven years ago and lasted eight months scarring my face. I read a forum of natural cures, and even feeling skeptical, I read about Apple Cider Vinegar, and give it a go – works like a charm, apply topically a few days (attention, at first it will BURN and STING) but keep it going and in a couple of days you’ll see it receding like a miracle, ingest a spoon with water as well, before shower to prevent redness. Tea tree oil proved as good, I’m using both and even having a major flare, I’ve been able to look normal and under control (I have the most aggressive Rosacea I’ve ever seen) – please, try. Hi there I am new to this group and I have to say wow the amount of people putting up with this frustrating, annoying….. and so on, disorder. Out of the blue almost overnight 10 months ago mine started and has been driving me crazy. I have cut out yeast as best I can and cut out sugar where possible because these things apparently feed the rosacea. It just seems one day you’ll think ok it seems to be kind of under control and then bang the next day and when you can’t pin point it, it’s so annoying. Honestly I really don’t know how much more water I can drink and I’m also trying alkaline foods too. Hope to get more positive feed back. Have a great day. time-release doxy to keep it at bay. Good luck everyone! I have tried everything possible, rosacea LTD IV combined with the jojoba oil, it did helped a lot, but now I have been drinking Organic Apple Cider Vinegar, 2 Tbs mixed with 8 oz of water first thing in the morning, and after dinner. I see my face so much better!!! I can’t believe I didn’t come across this after all these years. I strongly recommend it. I also have rosacea and i was keeping it under control to a certain degree but it has just flared up in the last few days and i have no idea what has caused it i have been off and on oxytetracycline tablets for years but help to control it but never seem to get rid of it It will take about a week now for the swealing to go down and my nose is painful to touch at the minute .Any advice out there would be appreciated . a tetracycline? It just recently became available in generic form and quite cheap. My doctor prescribed it at 150 mg and it quickly will settle a swollen nose down. worth it. i eat alot of the Cambell’s Chunky soups or Healthy Choice for lunch. a 16 oz jar of saltless peanuts in a few days now. It is a quick hunger fix to carry with you so you don’t go for the sweets and bagels with cream cheese. That was my former diet but no more. For nasal swelling Nasalcrom spray is a mast cell inhibitor and good to reduce swelling, bromelain/ querectin supplement is a potent anti inflammatory, isotretinoin is often very successful at low doses to permanently reduce the swelling and Avené skincare do a green tinted spf 25 moisturizer for rosacea and a special night treatment cream containing retinaldyhyde which reduces vein formation, increases skin thickness and treats redness. It’s a vitamin A derivative specifically developed for hyper sensitive skin. Pulse dye laser followed by IPL at a later stage treats redness and veins well. Can somebody please help me?I have adult acne.when I try to squeeze my face nothing comes out of my face.sometimes my face is red too. 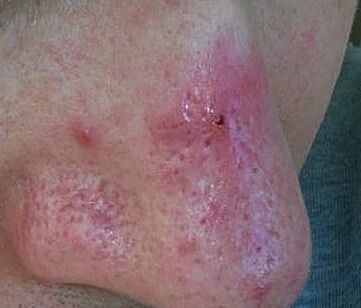 Rosacea when squeezed either produces nothing or a fluid discharge. 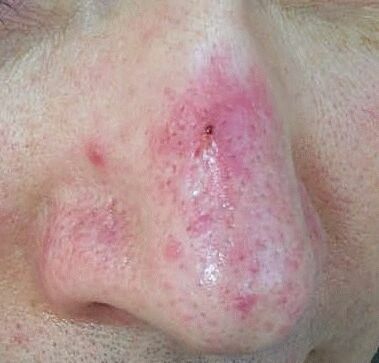 Rosacea papules are considered to be sterile because they are not caused by bacteria but an unknown etiology which causes swelling and leaking intercellular fluid. Antibiotics can be useful in calming rosacea and preventing secondary bacterial infection . I have had this roscia acme for 3weeks .I just started the metrogel a week ago. Washing my face with cetiphl now I see no improvement I see more breakouts I’m very depresse cvsd 45 yrs old I work in retail cvs. When will this go away! My face was breaking out in horrible pustules and red bumps all the time for the past couple of years since the Rosacea began. I tried avoiding spicy foods and all kinds of topicals. Nothing helped. My sister gave me a tiny bottle of Cetaphil Gentle Skin Cleanser, that she had gotten in the hospital. I started washing my face in that and within a couple of days it began clearing up. I’ve been purchasing and washing my face in nothing else for months and haven’t had a serious breakout. If I get too hot from physical activity I will have a few small ‘bumps’ but nothing like the way it was before. It has had no effect on the broken veins and capilaries, nor has it helped the dry sandpaper feel which I suppose is another wonderful gift from rosacea? I just purchased some CeraVe cream today as it got great reviews at amazon, hoping that will help with the dryness and redness. TriDerma Facial Redness Repair really did reduce the redness for me. Living in a small town no one stocks it here so I’d have to order online. I saw the CeraVe and decided to give it a try. Hi, I found that the 5:2 diet controlled by rosacea like nothing else has. My condition is all to do with diet. I would advise anyone with rosacea to give the 5:2 diet a try. The other health benefits of it are great too. Unfortunately it does require some commitment and will power.. but not that much. “What is the 5:2 diet? I found my diet helps the most. I am also finding that a gentle exfoliation of the thickened skin on my nose with a bit of Retin-a I am able to get the patches to go away. A little bit 2 times a day. I tried this before but my nose was too inflamed. Now that my diet has it under control the Retin- a is helping heal the last of a few patchey spots. Oddly I had this in my cabinet for a few years but never used it. Doctors wil prescribe it if you ask, Most insurances will pay if doctor calls insurance company since it generally is not approved for anything other than acne. My doctor called and I got it cheap but never really gave it a try until lately. So thankful I am makeup free finally and almost rosacea free. I have found Votre Vu Tragic Magic cream as the best treatment. It has lime in it which calms the redness. All organic and hand batched in France. I apply the Citrus Clear Spot Treatment it to new red acne spots and leave it on. I can see the redness fades right away and the next day it becomes very light. Last year I had a serious break-out and used tons of skin care products and my face was still full of dark spots, for a whole year. They disappeared within two months after using the Citrus Clear products. I am a 21-year-old athlete, and I have been suffering from a red nose for the past 8 months. I’m not 100% sure if I have rosacea, but after reading all the comments, I am quite certain I do. I am seeing a dermatologist next week. I have always had oily skin, and moderate acne, my entire life. When my nose flared up for the first time, I thought it was a severe breakout, due to the fact I had 15 whiteheads on my nose. I thought it was strange but thought nothing of it, when the pimples went away, and the redness died down. Unfortunately, the flare-ups continued, and I was extremely confused. I still thought I was breaking out, so I started washing my face twice a day, and that seemed to help. However, two red marks in the middle of my nose, wouldn’t go away. Someone mentioned in the comments that this is called a rosacea patch? The redness died down over the holidays and going into January, and I again forgot my ordeal. As long as I can remember, my nose always turns purple when I’m cold. Going to college in NJ, you can imagine how my nose looked this past spring. I’ve broken my nose a new times, and I thought the damage it experienced, mixed with low circulation, was the cause of this. Whenever my body heats up, my purple nose almost instantly goes away. 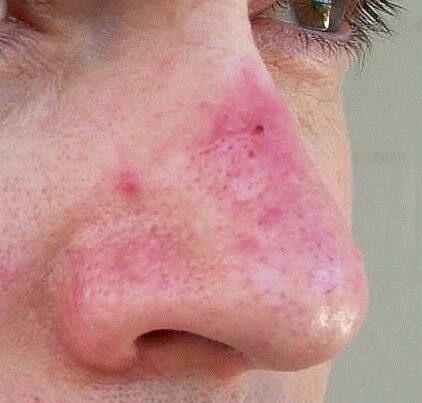 Is a purple nose a side affect of rosacea? My nose had a few bad flair ups this past spring, but the stress of school, and other things, put the redness out of my mind. Starting in early May, after school ended, my nose really started bothering me. I had a lot of time on my hands, and I spent a lot of that time taking pictures of my nose, and looking in the mirror. My face was clear everywhere else, but my nose was spotted red marks. Those two red marks that I mentioned I had, kind of faded in the spring, but they were bright red in the beginning of summer. At this time I started using heavy doses of sunscreen, whenever I went outside, and also bought myself some acne cream, which I applied along with washing my face twice a day. The redness died down, and then would come back again. I play soccer so I’m constantly outside in the sun, so I really can’t avoid my body temperature rising. I’m currently running 8 miles a day, but I haven’t noticed my nose getting really red because of it, which is strange. My current symptoms are, itchiness (just on my nose), very oily, enlarged pores, persistent redness, whiteheads, and blackheads. I also have noticed my left eye has been acting a little strange. It twitches occasionally, is itchy, sometimes red, and often times feels like I have debris in it. I may have Ocular rosacea for all I know. My question to all of you is, from your experience, does it should like I have rosacea? And if I do, how do you think I should go about treating it? How do you cope with it on a day-to-day basis? I hope my post wasn’t to long, and I look forward to reading your responses. My husband had a nose problem that sounds like yours all his life..He is 70. Doctors would give him cortisone creams that did not help much. When he squeezed his nose, cream cheese like squiggles would come out of his large pores. He would get inflamed pimples on his nose all the time. This year he saw a new dermatologist and he said he had enlarged sebaceous glands on his nose. The doctor proceeded to somehow dig some of them out. My husband does no know how this was done as he could not see what the Doc was doing, but it was uncomfortable. My husband had to wear bandages on his nose for over a week and was very embarrassed. The Doc told him to come back for another treatment in a month or so. He did not go back as we went on vacation. The bottom line is: It did work! Hope this helps. Young man, When I was your age i too started with this affliction. Back in the ’70’s tetracycline was the rage. never really helped much and made me nervous and anxious all the time. Doctors either laughed or shook their heads saying this drug doesn’t cause that. Said it was me. I had troubled relationships, difficult friendships and it interferred with my racing career. Now 40 years later, we know better. Antibiotics kill bacteria and will destroy your entire Gut Flora in the process leaving you vulnerable to severe yeast overgrowth Candidiasis. Back then Doctor knew best. Now we know these these poisons will not only make you sick but they deplete Magnesium and other crucial vitamins leaving you weak, nervous and irritable. Don’t get started on this path and then end up struggling when your 60. Research diet and anti inflamatory foods. Make sure your Vitamin D levels are over 70, not 10! Do the research and stay away from prescription drug poison. I feel better now than when I was in my 20’s. BTW, Dermatologists don’t know anymore about this condition now than they did in 1975. I go now & then to see what modern advancements could help me and they still reach for the prescription pad. “Here, take this”. I leave empty handed. Find yourself a good Naturopathic doctor. Good Luck! Has anyone within this support group tried the camuclear product? Mostly, my acne is on my nose, chin,and cheeks. I’ve been really embarrassed about it because it looks really bad, especially under makeup. I’ve tried to conceal it with different products, but really in the end nothing worked. I am no stranger to Noxema, Clean and Clear, Neutrogena, and St. Ives. While lots of them have helped in clearing up excess oil and a few of the blemishes, nothing really got rid of the redness. The only products that got rid of the redness was the Citrus Clear Sensitive Wash and the Citrus Clear Moisturizer. It cleared up the excess oil so well and the best part of all it got rid of the redness! I now am acne free using just Citrus Clear products and and have no redness whatsoever. I would really recommend this product to anybody who suffers from acne. My husbands poor nose was so red as well. The Somaluxe Redness Cream so improved it looks nearly normal, Twice a day I have treated his nose to a thin layer of the cream. It is now 1 month, and boy what a difference, the boils have all but disappeared, the red angry skin is looking healthier better colour . From the first day it started to calm the skin, only small pimples appear but are soon gone the Price is high, But needs must. I was diagnosed with Rosacea about 15 years ago but I think it was a misdiagnosis. I’m olive-to-sallow skinned with no redness at all. I have tiny, very itchy pustules over my cheeks mainly but they appear anywhere on my face. I’ve been trying to find exactly what I have and some sort of controlling medication. I’m fed up with this condition. I have struggled with red skin for years. I have adult acne and as a result have many old scars and red skin. I struggle to leave the house without make up on as my skin looked so sore and inflamed. I have tried many rosacea treatments and most have left me with very dry itchy skin as my acne sill pops out around my neck and jawline. This however the Somaluxe Redness Repair has really helped. My red skin is starting to fade. It’s also helping with current acne spots. There not dry and itchy anymore my breakouts seem less severe as the redness has reduced. I love the product. what works for my rosacea is sulfur. Washing even day with sulfur soap has kept all the spots away. The best thing ever.